December 21, 2008 by Alphageek in "alphageek scotch edradour scotland"
I have been holding onto this box of Scotch, with the empty bottle in it, for several years. Friends brought this back all the way from Scotland, just for the Alphageek´s pleasure. 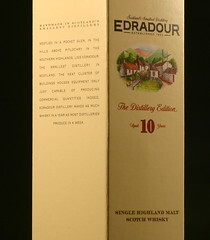 It turns out that this bottle of Edradour is only available at the distillery. Although the Alphageek is not a scotch aficionado, this particular scotch went down very easily. It was certainly an honor to enjoy something that was brought from another country, just for the Alphageek's enjoyment. This bottle served as an inspiration for this website! While drinking the last little bit, it seemed a shame to not honor the memory of this fine scotch in some way. I decided it would be great to photograph it. I then wondered what I would do with the pictures. So I did what anyone would do. I put the bottle away for several years. I then proceeded to decide on a little different approach and write about bourbon. This box then stared at me for a while, begging to be on the website. I have finally relented and added this to the collection, given the great new black background that Mrs. Alphageek likes. With Christmas fast approaching, please remember the Alphageek is primarily a bourbon guy, but a good bottle of scotch would never be rejected.